Its all about service. Since our founding in 1962, the Frederic Township Fire Department has built a strong reputation for serving the citizens and visitors of northern Crawford County. From fire suppression, rescue, and emergency medical services, to our emphasis on fire prevention and safety education, the department has always worked diligently to meet the changing needs of our community. This website is another channel through which we can deliver important information and services, in order to further serve the public. Michigan, like many states across the country, have stories reported in the news media of newborn babies abandoned in dumpsters, parking lots, car washes or public restrooms. While there are a number of reasons a frightened or panicked parent may abandon a baby, this newborn abandonment phenomenon led many states to look at how to prevent such happenings from occurring, thus saving lives. On June 26, 2000, Michigan enacted the Safe Delivery of Newborns law with an effective date of January 1, 2001. While targeting desperate parents, the law encourages the placement of their newborns in a safe environment as opposed to an unsafe environment. This law allows for the safe, legal, and anonymous surrender of an infant, from birth to 72 hours of age, to an emergency service provider (ESP). An emergency service provider is a uniformed or otherwise identified employee or contractor of a fire department, hospital or police station that is inside the building and on duty . Emergency service provider also includes a paramedic or emergency medical technician when either of those individuals is responding to a 9-1-1 call. The parent has the choice to leave the infant without giving any identifying information to the ESP. The ESP, upon accepting the infant will provide whatever care may be necessary. Following an examination at a hospital, temporary protective custody will be given to a private adoption agency for placement with an approved adoptive family, if the child is unharmed. If the examination reveals signs of abuse and/or neglect, hospital personnel will initiate a referral to Children's Protective Services for an investigation. Private adoption agencies are also listed at the following Web site: www.mare.org. 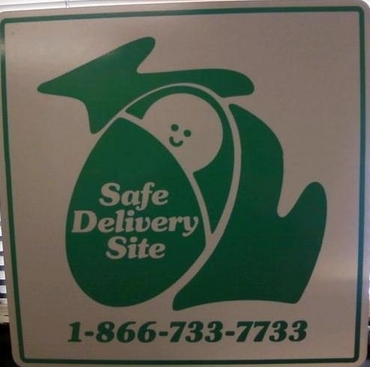 To promote the Safe Delivery Program, the Safe Delivery Program FACT Sheet (DHS Pub 867) describing the intent of the legislation, has been developed. A toll-free, 24-hour telephone line has also been established to provide information on services available to a prospective parent. The toll-free number is: 1-866-733-7733. Our greatest defining moments often stem from ordinary days. This was no different for Fire Chief Douglas Pratt or the men and women of the Frederic Township Fire Department on June 7th, 2011. It was a warm, sunny June day after a thunderstorm, and like any other summer day those who had it off were out enjoying it; visiting family members, preparing to go out boating, or simply enjoying the day away from home. Being a Tuesday many were working outside of the fire department itself and like any other call when the pagers when off, firefighters from Frederic Township dropped everything to answer the call for a report of smoke seen in the area of Howes Lake Rd and M-72. With a column of smoke that towered visibly in the air from miles away, Chief Pratt wasted no time in calling a request for assistance from Grayling and Bear Lake Township Fire Departments. In the heart pounding race to get to the station and protect their community, responding firefighters were already feeling the effects of adrenaline pouring through there system as pulses quickened, breaths became shorter and blood flooded to their limbs in preparation for the battle to come. As the smoke column grew larger the closer they got every firefighter responding would quickly realize they were in for one hell of a fight. 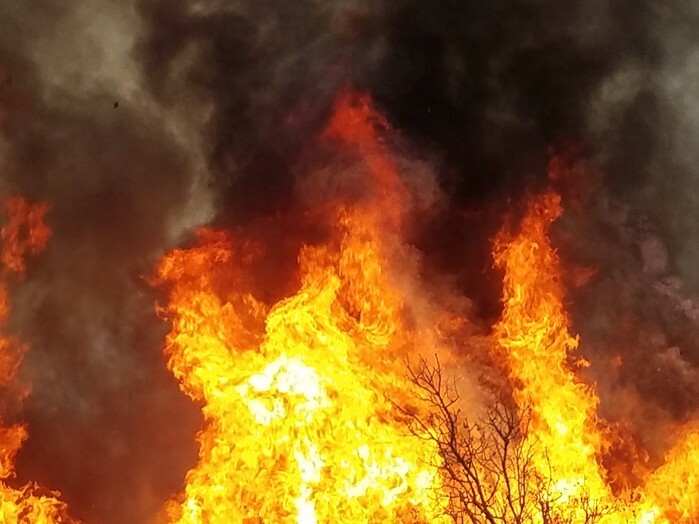 Upon the simultaneous arrival of the units from Frederic Fire and Grayling DNR they found a fire that had staked vicious claim, surrounding itself with Michigan’s most dangerous wooded fuel source and every Wildland Firefighter’s nemesis, the Jack Pine. Blazing its fury at the fire engine from Frederic and Bulldozer from the DNR the fire fought its way to the top of the trees where an endless supply of oxygen and fuel waited there for the taking. Crews fought desperately to contain the monster to no avail and were forced to retreat as the fire reached the top of the tress and began its race to demolish anything and everything it could before its destined destruction. Joining forces with additional fire units from Frederic Township, Bear Lake, the DNR and Camp Grayling firefighters engaged in their second battle with the beastly fire trying to cut it off from crossing Pheasant Run Rd. Again, their efforts were thwarted by the raging inferno. With Chief Pratt, already having requested more resources from Kalkaska Fire, Coldsprings-Excelsior Fire, Blue Lake Fire, Lovells Fire, and Otsego Lake Fire Departments the gloves were about to come off. Ordering units to reposition once again, Chief Pratt announced on the radio, “We must stop the fire at Chipmunk Trail and Manistee River Rd or there will be no hope for the homes along the Manistee River.” Once again, the firefighters put themselves directly in the path of the fire taking a final stand to protect the residents and their homes in the beasts’ terrible path. The fire had to be stopped once and for all to prevent the loss of the homes along the river that would stand no chance against the huger of the fire. Taking their places on the front lines, with residents of the homes already evacuated, firefighters worked quickly and efficiently to pour thousands of gallons of foam on the homes to protect them from the fire’s destructive path. Trees were soaked along the Manistee River and Chipmunk Trail with water creating a well forged fire barrier. With the flames racing towards them the courageous men and women of the Township and Military Fire Departments put their very lives on the line to stand their ground and stop the terrible fire’s reign. In the battle to end all battles the beast was defeated. As the crown fire gasped its last breath firefighters found themselves victorious with trees blackened to their very tops in front of them and proud defiant homes untouched behind. Even the homes caught in the very midst of the fire survived the attack of the flames with only exterior damage to siding. The largest wildland fire in Michigan of the year had been slain, much as a dragon by the blade of a heroic knight in shining armor. 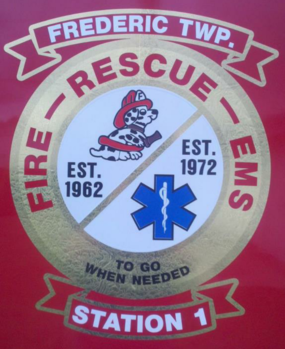 Copyright © 2013 Frederic Township Fire Department. All rights reserved.